The red-brick Imperial Hemp Building [Teikoku Seimai Kaisha], astride Nihonbashi Bridge, c. 1930. 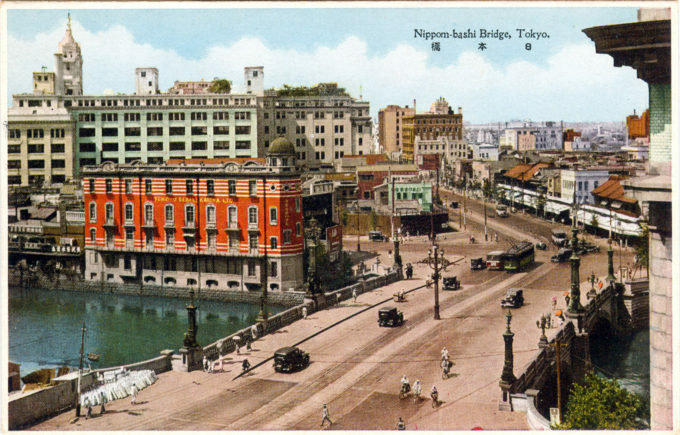 Behind it is Mitsukoshi department store. 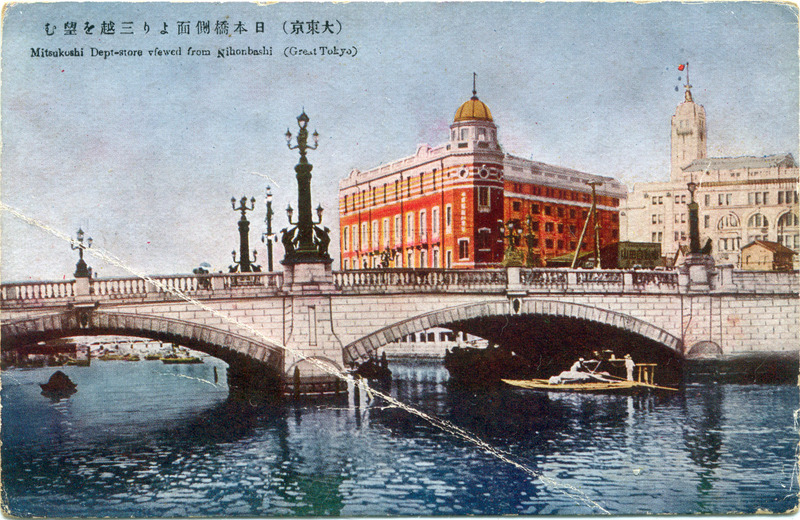 Nihonbashi Bridge (foreground), the Imperial Hemp building, and Mitsukoshi department store (right), c. 1930. From the wiki: “Tatsuno Kingo studied architecture at the Imperial College of Engineering where he was a student of the influential British architect Josiah Conder. After his graduation in 1879, Tatsuno journeyed to London in 1880 attending courses at the University of London. On his return to Tokyo, Tatsuno taught first at the Imperial College of Engineering before becoming department head at University of Tokyo. “In 1886, Tatsuno was one of the founders of the forerunner of the Architectural Institute of Japan, the then-named ‘Building Institute’. The organization was based upon the Royal Institute of British Architects. The group met regularly, sponsored lectures, and produced Japan’s first architectural journal.